PTFE is renowned as the most chemically resistant material known. Only a very few aggressive materials can effect it. PTFE lined hoses can therefore be used for a wider variety of chemicals than any other hose type, making it the ideal choice for very corrosive chemical applications and multi-product applications. PTFE BRAIDED HOSE ASSEMBLIES can resist temperatures from -70 to +230 degrees centigrade depending on application. Smooth bore is available with a single or double 304 stainless steel braid. There is a choice of standard bore or big bore which is more suited to hydraulic hose tails. Anti-static smooth bore is also available along with a range of protective coverings. 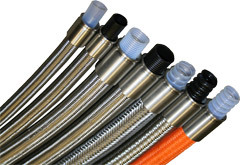 All our hose assemblies are available with a wide range of crimped end connections. Bore sizes range from 1/8 to 1”nb. Visiflon is convoluted PTFE lined which gives excellent flexibility, available with 304 stainless steel or a polymer braid. Visiflon is also supplied anti-static. As with smooth bore Visiflon hose assemblies are available with a wide range of end connections. Bore sizes range from 3/8 to 2”nb. Visiflon is resistant to full vacuum up to 1”nb up to 130 degrees centigrade with a stainless steel braid. Hyperline is unlike any other PTFE hose currently available. The liner has a smooth bore but convoluted on the outer lining, to combine the ease of assembly and high flow rate of smooth bore with the flexibility and kink resistance of a convoluted hose in one product. Available with 304 stainless steel or an aramid braid. Hyperline is also supplied anti-static. Bore sizes range from 1/4 to 1”nb. Bioflex and Corroflon hose assemblies are also available from ADT Flexibles.